As I wait on standby for this webinar to begin, I fear that I am going to be, once again, in over my head. The first STEM webinar in this series was hosted by Dr. Michio Kaku, and although he fascinated me, he lost me. After all, I’m just an English teacher on science disconnect. Still, I am inspired always by Patti Duncan‘s work and her ability to reach a cross-sectioned audience. I had the pleasure of seeing her in action at our PA DEN VC Live Event last autumn, and I will tell you that if she taught me science way back then, I might have taken a different career pathway. In the pre-moments before start up, Patti mentioned that she will be sharing materials that cross all grade levels. Matt Monjan discussed the Siemens STEM Academy that was launched as a four-prong program with engagement with a portal, webinars, and a STARS program designed to foster STEM achievement among educators. Having spent some time on this site, I can attest that is is a place of abundant collaborative resources and professional development. Introducing Patti, Matt recalled her science teacher background that is mixed with a non-educational business background as well. STEM is the result of a government initiative to increase STEM education in the classroom, but it’s not about doing more STEM in the classroom. It’s about creating an environment that enables students to explore STEM subjects and graduate into a business and scientific community. So it’s about problem solving, thinking outside the box, designing experimental projects, working collaboratively. Additionally, STEM initiative is about career awareness, letting student know what they need to study in school. 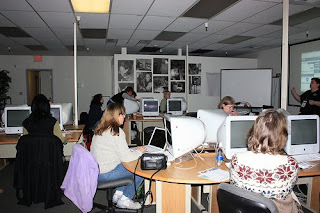 Instructional techniques and ways of learning as well as building a knowledge base for students. STEM is about integration that makes students problem solvers, innovators, and inventors. Give students the problem, not the solution. Students should be creators of content, and apply concepts to learning. Students should be inventors and creatively design, test, and redesign then implement solutions. Students should be self-reliant logical thinkers. Teachers need to let go of control and give students the opportunity to design and create. Students need to be technologically literate; they need to work with machines, computers, software programs, websites, but they also need to understand how all of those things work. Using the technology as a tool to an endgame is what really matters. The first resource is the Siemens STEM Academy, a partner with Discovery Education. This website is loaded with such rich resources that it simply must be perused at leisure so you can begin to explore the wealth of learning and teaching opportunities. Whether you are looking for lesson plans or professional development, this website is for you. And don’t forget to click on the RSS feed to add the blog posts to your reader. The Siemens STEM Institute is a brand new initiative for selected teachers to spend a week of total immersion in participatory STEM education. Apply now. Patti can’t wait to meet you there. The final great aspect is the STAR program. Teachers selected for this program go to Oakridge for two weeks of hand-on research. You get to learn what it is like to work as a researcher, so if you are interested, please apply. Patti’s second resource is the National Science Foundation Resources for STEM Education. This site provided teacher development, research syntheses, instructional materials and assessment tools. Third is The STEM School Blog that aggregates the best of STEM resources that are being used in the classroom. Fourth is the Minnesota STEM website, a rich overload of aggregated resources in a format that will definitely engage students. 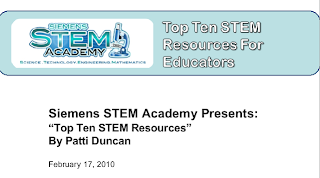 Fifth is The STEM Education Blog, and Patti likes this blog for its links. This blog is written from a teacher’s point of view. Next is PA STEM Initiative, and in my opinion, is has a governmental look/feel to it. A great example of a state’s resources, and has some links for grants that really should be explored. The Teach Science and Math Blog, written by a professor, focuses on individual lessons within disciplines, giving a toolbox for the classroom. 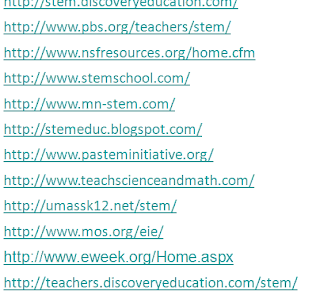 I’ve lost count, but next is the STEM ED website, and let me tell you that this site is loaded. If you teach science, this site is nirvana, leading you to so many more richly-laden sites–almost sensory overload for integration in different science disciplines, including some fantastic earth science hands-on PBLs. Honestly it was hard to keep up with the host of sites that open exponentially once you simply explore one of these sites. Engineering is Elementary is a site that preps elementary school students for a STEM-type career. You simply MUST check out this site because if you are a parent, you want this site; if you are a teacher, you should be using this site for curriculum design, resources, research, and PD. STEM Connect is a Discovery product, and if you have access to Discoverystreaming, you can access STEM Connect. You have the fine quality of Discoverystreaming videos on STEM topics, but then you have hand-on design projects that give lessons 21st century functionality. As only Discovery can, it inspires the possible and ignites excitement among students and teachers. National Engineers Week is a great site Patti discovered last night, which lead her to Discover Engineering, and let me tell you, I love the flash and cool and the lingo of this site. It brings out the kid in me, that frustrated wanna’ be scientist (that I will never be). Trust me, check out these 2 sites. Wicked good! And mostly because it forces you to work with that trial-and-error concept that is the world of science. Patti says we have to teach our students to accept failure because science functions on failures that lead to brilliance. Tomorrow is National Introduce Girls to Science Day, and the push is on to get girl engineers, mathematicians, STEMmers. And just in case you wanted Patti’s list, here it is. So I am not going back to link to them. If you didn’t know why sooner, you certainly would know now why she was one of Discovery’s very elite 5 new DEN Gurus. Thanks so much, Patti, for sharing. Loved it.